Lombardy Poplar is a fast-growing deciduous tree. They work great as a windbreak or screening. 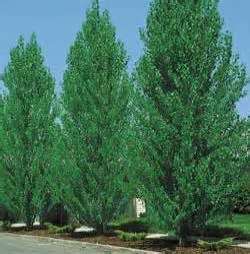 Lombardy Poplars have a very rapid growth rate, from 1' to 5' per year. These trees can reach 60' at full growth. Lombardy Poplar likes to be planted in full sun. Plant 5'to 8' apart for a fast filling living fence. The wind on a breezy day rustles the leaves and creates relaxing sounds. The green leaves with silvery undersides give way to fall colors of yellow. Birds enjoy nesting amongst the branches for the protection these trees provide. Lombardy Poplar will tolerate wet locations and this is a Firewise plant.